Tina’s love of running began in 2nd grade. Her father, a fireman, took her to the yearly fireman picnic where they had kid races. Tina started her racing career outrunning both the boys and girls. She continued to run throughout primary school and through her freshman year at Eastern Washington University until a knee injury ended her college career. At age 25 Tina ran her first marathon. Friends told her to just try to finish but instead she pushed herself running a 3:14:58 qualifying for Boston. She continued to improve until she sustained a hip injury that would dog her for the next 16 years. In spite of the injury she continued to run no matter how slow or how much the hip hurt, competing in races from one mile to 50k. At the age of 40 she ran the Colorado Marathon in 3:12:09 finishing 4th overall. In 2010 Tina began trail running because the flat and fast road races had become too frustrating. 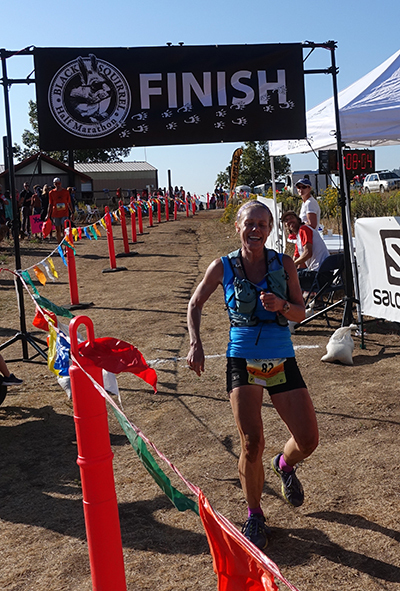 Her first trail race was the Desert Rats Trail Marathon in Fruita, Colorado in 2010 where she ran a 4:21 finishing fifth, she was hooked and never went back to road racing. In 2016, after years of seeing multiple physicians and PTs without improvement in the hip, she was finally diagnosed with a labral tear and had it repaired. After a year of recovery she is running as well as ever and is on fire to run hard, meet fellow trail addicts and promote trail running. This led her to join the Gnar running team in 2019.